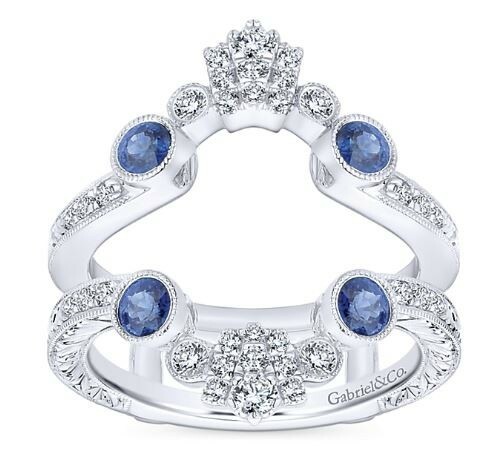 This Gabriel & Co. diamond wedding band enhancer is crafted in 14k White Gold and features (4) Blue Sapphires totaling 0.60 carats, and Round Brilliant Diamonds totaling 0.35 carats. Are you ready for an Anniversary Band that will transform your Diamond Solitaire Wedding Ring into Diamond Ring that mirrors your one true love? Since the wedding, you've had some time to identify the different styles of wedding rings that attract you, and an upcoming anniversary is a perfect time to upgrade your ring. 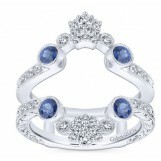 A Wedding Ring Enhancer is a perfect compliment to any solitaire diamond ring. The Enhancer essentially replaces the need to wear a wedding band and transforms your solitaire ring into a new diamond wedding ring that flaunts your unique style. There are several different styles of Wedding Ring Enhancers that are designed to blend the two rings seamlessly together, creating the illusion of a single ring. Different styles of Enhancers include Ring Guards, Ring Jackets, and Ring Wrap. The Ring Guard adds more diamonds around the solitaire diamond and features a cradle into which you slide your solitaire ring. A Ring Jacket and a Ring Wrap are custom made rings that fit snugly alongside your solitaire ring, with the Ring Wrap is designed to wrap around the center stone. Ring Enhancers are specially designed to conform to a specific shape of a diamond and can be customized to fit any diamond shape. Whether your wedding ring sparkles with an emerald-cut, princess-cut, or a traditional round brilliant diamond, the best ring enhancer will accentuate the beauty of your diamond. Upgrading your wedding ring with a diamond ring guard, ring jacket, or ring wrap wholeheartedly preserves the sentimental value of the wedding ring you wore down the aisle. A ring guard is both practical and functional as it offers the ultimate freedom to choose when and where to dress up your solitaire wedding ring while granting you the option of wearing the solitaire ring all by itself. However, if you consistently wear both of your rings, you may have them soldered together.